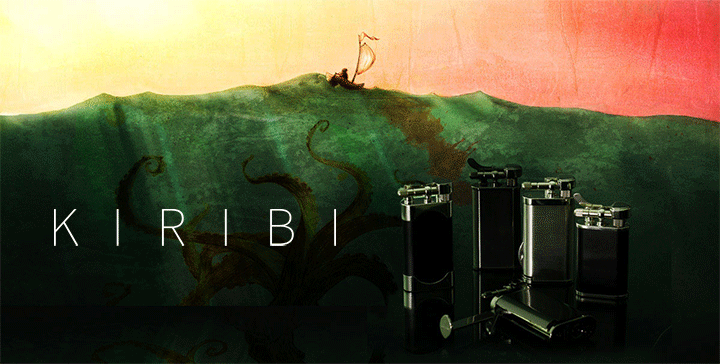 Kiribi Pipe Lighters | Chicago's Pipe, Cigar & Tobacco Store | Iwan Ries & Co. The origins of Kiribi lay in the traditional Japanese practice of casting sparks upon a beloved traveler’s back, in order to impart fortune and ward off evil, blessing them on their journey. The practice hearkens back to the famous 8th century legend of Prince Yamatotakeru, and the aunt who gifted him the firestone and striker which saved his life along perilous travels. In time, the same simple tool kit that was used to perform the original Kiribi came to be used by the countryfolk of Japan to light their pipes; and thus the inspiration for the Kiribi line. All acts in life involve an important first step, and enjoying a bowl from your favorite pipe exceptionally so. Every spark, whether it is struck for a pipe or a cigar, or a chance-met stranger’s cigarette, sets us upon a little journey of our own; and a little extra good fortune can't hurt. The Kiribi lighter combines smart, retro styling with modern improvements in engineering. Innovations such as a dual-flame design, which provides the benefit of a wider, more gentle light for your pipe and a single tank construction of extraordinary fuel capacity. Much as we demand of all things we rely upon every day, that which become dearest to us, entirely hand assembled in Japan, the Kiribi construction is meticulous. You can feel it in your hand; a gravitas created by the nickel, steel, and brass serving in all the essential parts. All, save one: the confident snap of the flame-cap is provided by yet another innovation, a spring made of a special polymer more resistant to fatigue even than steel. Our choice of accessory items speak volumes to people we encounter every day. They quietly reflect a sense of our tastes, discernment and outlook, and do so in a manner without ostentation or braggadocio. Light a lady’s cigarette upon a chance encounter, with a Kiribi. You will be speaking with confidence… without saying a word.